Briefly, what is this book about? In this book I explore the history of power and human movement throughout the Indonesian archipelago in order to understand the scaling of language forms that has taken place over centuries, during colonialism and the development of the post-colonial state, and now in an Indonesia coping with the processes of ‘globalization’. I collected my data during a 2 month stay in Central Java in 2008, a 10 month stay in the 2009-10 school year, and another 2 month stay in the summer of 2013. My participants were English majors at a Christian university; I spent the 2009-10 school year teaching courses in their department ranging from Sociolinguistics to introductory speaking for first year majors. I recruited my focal participants in my Fall 2009 Sociolinguistics course. Over the course of our year together I interviewed the participants in individual and group settings, and spent time with them and other students outside of classes over dinner, coffee, church, or at their family homes. In this book I first discuss the theoretical concepts I used to interpret my data, then I explore the history of power and migration throughout the archipelago. I relate this history then to the development of Indonesian as a national language, and to contemporary use and ‘loss’ of Javanese, the primary local language of Central Java. Finally I discuss the overwhelming presence of English in Indonesia, and how the ‘state project’ generally relies on and resists English and its presence in the country. In all, this is an examination of how these three languages fit within the national project, and how the state continues to try to influence the ways in which they are used and the ways in which they are tied to the national, local, and global identities of their citizens. Which field(s) do you think your book engages with the most? This book engages with the fields of Sociolinguistics, Linguistic Anthropology, and Applied Linguistics. I’ve been a lifelong ‘jack of all trades, master of none’, and so I prefer to reach across disciplinary boundaries as much as possible in trying to gain a holistic picture of my research context. It is in this sense that I find it useful to rely on the label of Applied Linguist, as through this title I feel less beholden to any one field, and I feel like I can drive my work toward my long-term end goal of improving societies through education, language learning, and intercultural exchange. I am also not a fully ‘pedigreed’ Linguistic Anthropologist, and so it is possible that a reader from the field of Linguistic Anthropology will find my work ‘not anthropological enough.’ And so again, the application of the Applied Linguist label, I feel, allows me more freedom to take my work in whatever directions I feel interested in for the purposes of the project at hand and for my own long-term goals. Who have been the main scholars that have inspired you as you have written this book? I have most strongly latched onto in my work the writings of Jan Blommaert, Alastair Pennycook, and Monica Heller for theory, and onto Anthropologists of Education for my methods, namely through foundational coursework with Perry Gilmore for Discourse Analysis, with Norma González for general field methods, and with Richard Ruíz for Language Policy studies. Besides the normal suspects of Linguistic Anthropologists, Applied Linguistics folk and Indonesianists, who do you see as your main readership? This is clearly a book for graduate students and professionals in the field. I hope that readers will take away from this book the importance of situating our work within deeper historical contexts. Part of this importance for me comes from the desire to explain that Indonesia’s current historical context is not the way it is simply because of the development of the nation-state in reaction to European colonialism. Many of Indonesia’s current sociolinguistic facts are due to human currents and power dynamics that have been going on for far longer. Those deeper historical dynamics are possibly much more evident on islands farther away from Indonesia’s political and cultural ‘centers’ like the islands of Java and Sumatra. 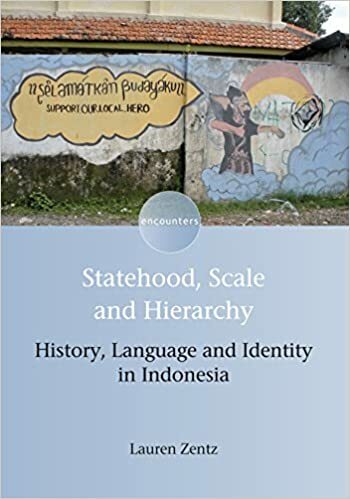 It is probable that in Java we in fact see some of the consequences of colonialism and statification as much more influential in contemporary life, or at least that we see them quite differently across contexts within this one expansive country. What do you think were your best strategies to help you get this book completed? For me the answer was keeping a schedule. I’m no proponent of one size fits all solutions, but for me, having a life outside of my work is a serious key to maintaining sanity. During summer writing periods I would keep a regular 8-5ish work schedule with exercise before or after (or in the middle if I was getting antsy) work time, and I would take regular work breaks consisting of a walk outside (100 degree Fahrenheit heat be damned!). During semesters, I would limit teaching work to teaching days, and I would keep the other days of the week as research-only days. Tasks like grading were reserved for times when I was too tired to do much thought-intensive work. As you wrote the book and reflected on your research methodologies, did anything strike you as something in need of change? For me the biggest thing was adding the historical component. As I began writing my book I just felt that this was an empty story without that. So I spent a lot of time during the writing process digging into historical accounts of how Indonesia has come to be. Another important thing to me was taking time to problematize terms that earlier I did not have the time nor the experience to problematize; words such as ‘globalization’ and ‘translanguaging’/’polylanguaging’/etc. For the former I reached across disciplinary boundaries to see how other fields approach this term, and for the latter I took more time to delve into writings on these topics, from across linguistic fields. Has this book motivated you to start the next book/project? If so, then can you tell us a little about your new work. I’m not sure if writing a book inspires anyone to write another one! But I will admit that having written a first book makes me feel more confident in having a go at another one. That being said, I am currently reminded daily that having this experience under my belt does not make a second project go any faster or smoother. I have moved on to two new projects – neither in Indonesia – and starting from scratch is simply starting from scratch, no matter whether it’s your first, third, or fifth research project. It all just takes lots of time, reading, data collection (and revision and revision and revision), note taking, and patience.